Learn to get your application deployed on the web so that your users in Sydney can enjoy the same amount of latency as those in Minneapolis or Kuala Lumpur. 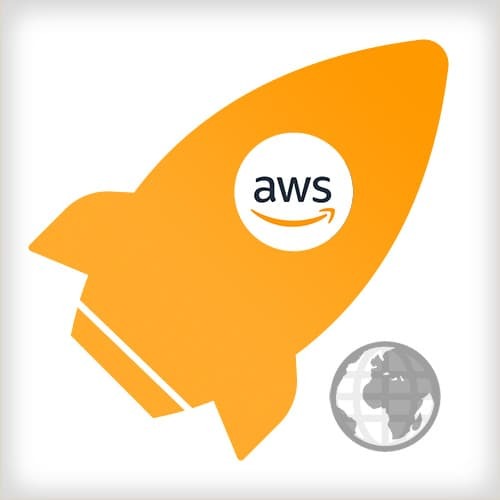 By coding along with Steve Kinney, you'll examine what AWS offers for front-end engineers — from storing and hosting client-side applications on S3, registering domains names and DNS with Route 53, deploying applications with AWS CLI, distributing applications with CloudFront's CDN, and much more! Steve Kinney walks through how to set up an AWS budget and alert notifications, in case free tier limits are exceeded on AWS. Steve sets up a new AWS account with a subuser and configures MFA on both accounts as well as discusses AWS's Identity Access Management (IAM). Steve creates an administrator user that is separate from our root user and prompts students to set up two-factor auth on the newly created IAM administrator account. Steve introduces Simple Storage Service (S3), one of AWS's oldest and most popular services. S3 is used for storing and hosting the course client-side application on the web. AWS offers domain name registration through its Route 53 service. CloudFront wants S3 buckets that are named after the respective domain name. Since both domain names and bucket names are globally unique, make sure neither has already been used. Steve explains how bucket policies work and how to generate policies for an S3 bucket. Steve configures an S3 bucket for static web hosting. Along the way, he explores some of the additional features offered by S3. Steve takes a quick tour of the AWS CLI. Steve also sets up named profiles and other configuration for the AWS CLI. Steve uses the AWS CLI to build and deploy the course's React application to the S3 bucket configured for static web hosting. Steve introduces Route 53 along with a brief explanation of the Domain Name System (DNS). Steve sets up the recently purchased domain name to use with the new static website that was created earlier. Steve creates an SSL (Secure Sockets Layer) certificate using Amazon Certificate Manager to establish an encrypted link between the web server and a browser. Steve solves a bug where client-side routes cannot be navigated to directly — the best way he can for now. Steve sets up a second S3 bucket for redirecting from the "www" subdomain (e.g., http://www.example.com) to the bare domain (e.g., http://example.com). He also configures the DNS settings in Route 53 to work with the new bucket. CloudFront takes a few minutes to set up, so Steve starts by creating a CloudFront distribution for the application that was deployed earlier. Steve redirects Route 53 from the S3 bucket in us-east-1 to CloudFront. While waiting for the CloudFront set up to complete, Steve more formally reviews AWS's content delivery network (CDN). Steve readdresses the problem with client-side routes and answers questions from students. To deploy a new version of an application, Steve demonstrates how to invalidate versions of the previous version at the edge nodes of CloudFront. Steve sets up Travis CI to automatically deploy new versions of the application to S3 as well as remove previous versions of the application by invalidating CloudFront's caches. Steve shares a .travis.yml template to make deploying to S3 and CloudFront easier. Steve creates another create another IAM user with restricted permissions to keep from sharing administrator credentials with Travis CI. With a new IAM user set up with a custom restricted AWS policy in place, Steve deploys the course application with Travis CI. Steve takes questions from students. Make a new commit to master and push it up to GitHub to trigger a new build. Steve takes questions from students. Steve introduces Lambda@Edge, a new service from AWS that allows you to deploy Lambda functions to your CloudFront Edge nodes. Steve walks-through setting up a Lambda@Edge function for resolving client-side routing problems and 404 File Not Found errors. Steve uses Lambda@Edge to manipulate HTTP requests on the fly. Steve audits the security of our new application, and it fails, so he writes a Viewer Response function to address the holes in the application. Steve sets up an Origin Request function to create a 302 redirect for a particular route. Steve takes questions from students. Steve discusses further ways to improve the build and deployment process with Terraform or CloudFormation. After taking questions from students about automation with Lambda and using CloudFront in front of an organization's own servers, Steve wraps up the course.